Just kidding. I’ll definitely have to go into more detail on this one. X-Men: First Class is a film that looked impressive from the previews, but I certainly had my doubts and/or hesitations about the film itself. I can happily say that any and all doubts were completely blown out of the water, mostly by a vicious attack of mutant powers. 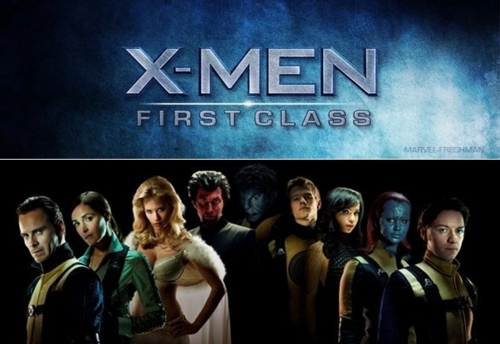 X-Men: First-Class is EXACTLY what a prequel, scratch that, what a comic book film should be. It is the best origin story I’ve seen since Sam Raimi’s Spiderman. The first sequence is an amazing, gripping, shot for shot reproduction of a sequence in the first X-men film. For the few of you that have not seen the first X-men film, do not despair, this title stands completely alone on its two feet. It introduces the characters in an emotional rollercoaster that predetermines the views held by the two major protagonists. This is indeed a story about friendship. It’s a story about two men, alike in many ways, but powered by their personal experiences to form the beliefs which will lead them to their destinies. Professor Xavier, played by James McAvoy, is a young, brilliant, but still playful and randy young man. His introduction will simultaneously set him up as a father figure, and give you just the right amount of comedic relief that will remind you that, yes, even your own father is human. The soon to be Magneto, in an amazing performance by Michael Fassbender, is, well, amazing. This character knows nothing but pain, and as I said, the first sequence will tear your heart out. What I may be most impressed with is the mixture comic book history and American history in this film. Being set during the Cuban missile crisis, I find it hard to believe that these events didn’t actually take place. The overall feel of the film captures the soul of that era, and puts our characters in mirroring images of the troubles of the times. WATCH THIS FILM!!! Your humble author is still trying to organize his thoughts after being completely taken aback by this film. Ultimately, it is so much more than a superhero film. It is a story about brotherly love, the human condition, and how life can lead the best intentions so horribly awry. Marvel Comics and Columbia Pictures have now cemented their glory days with this one. I know some of their superhero movies have been slightly lackluster, but this is not a movie capitalizing on the comic craze, it’s a film where each person involved in production gave it their all, put their hearts into it, and the results are absolutely breathtaking. Also, this will add a great new chain to six degrees of Kevin Bacon. This entry was posted on Friday, June 3rd, 2011 at 12:13 pm	and is filed under Comics, Film, News. You can follow any responses to this entry through the RSS 2.0 feed. You can skip to the end and leave a response. Pinging is currently not allowed.